Rather underpowered in several areas but innovative and great fun, this is a plugin that all Cubase 7 users should check out. Great for quick loop creation. More useful as you add more samples. Very competitive price. Useful tempo offset. Requires Cubase 7. Some options need expanding. No actual loop editing. Hot on the heels of Cubase 7 comes Steinberg's new beat-slicing plugin. 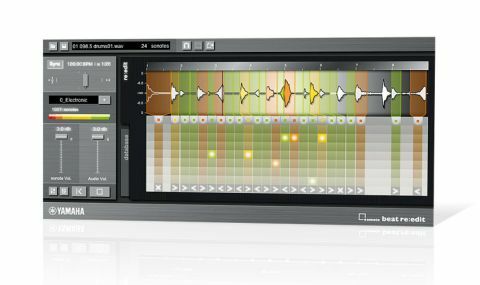 A VST instrument based on Yamaha's sonote technology, sonote beat re:edit starts by analysing audio loops and dividing them up into categorised, colour-coded slices called 'sonotes'. "sonote beat re:edit starts by analysing audio loops and dividing them up into categorised, colour-coded slices called 'sonotes'"
A red sonote indicates a low-pitched attack transient, orange or yellow a mid-pitch one, and a green sonote represents a high-pitched attack. Source files are limited to four seconds maximum (anything beyond four seconds is ignored), and you can have a maximum of 24 sonotes per file. You then set each slice to play in one of three ways: forwards, reverse or mute. Everything plays back in sync with the project tempo, or you can modify the plugin's tempo against that of the host (from half to x2). With the analysis complete, seven similar-sounding alternative sonotes are displayed in a column below each slice. These are sourced from the instrument's databases (factory and user), of pre-analysed sounds. Each alternative sonote is selected and auditioned simply by clicking the required checkbox in the column. They're also arranged intelligently so that as you move further down the column, the sonic characteristics move further away from those of your original slice. If you want to change the character of a slice completely, click your original slice at the top and change the colour category. This results in a new set of seven sonotes appearing below. As an alternative to swapping things manually, there are two Randomise options onboard - one retains the original categories in the columns but randomises the chosen sonotes, and the other randomises the column category as well. Finally, some elements of a loop won't be detected as sonotes at all and will continue to play back as regular audio. The two types of source (sonote and audio) are balanced using the two level faders on the left. sonote beat re:edit is certainly a curious plugin, and it's unlike any other loop editor we've encountered. At times, the analysis of slices seems a bit unpredictable, and you don't have the option to manually tweak the analysis process at all. "If you have lots of loops and want to create something new with no preconceptions, it's definitely worth a look"
However, from a creative perspective, if you forget about that and just get on with reconstructing your loops using the available tools, it really can be great fun. For us, the process really began to get moving once we'd imported our own samples into the database. If you have a clear vision of how you want to change your loops, this probably isn't the tool with which to realise it; however, if you have lots of loops and samples and want to mix things up a bit and create something new with no preconceptions, it's definitely worth a look. It could benefit from more extensive editing of the analysis process and loop re-ordering options, and the database system should enable combining and editing of databases more efficiently. Even so, at £41, sonote beat re:edit will hardly break the bank, and like we said, the more you put in, the more you'll get out.